It's Monday, time for another one of MJ's Monday Sketch Challenges....This weeks sketch was a very easy one - I've created 3 different cards to show just how versatile a sketch can be. For this card, I rotated the sketch on it's side. I used the Burnished Embossing Technique from a past issue of the TJNL, with my Ornate Tooled Leather stamp. I stamped my Silhouette Asters from Starving Artistamps in Blue Bayou Ink on white card stock, then cut out a circle with my coluzzle, I layered this on a piece of Chocolate Chip card stock that I punched with my Marvy Scallop punch, then pierced holes with my piercing tool. The sentiment is from Stampin' Up! 's Love & Happiness rub ons. 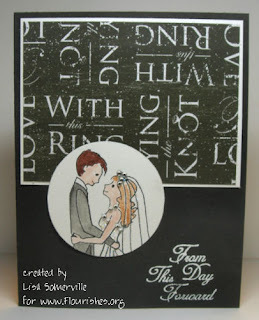 For this next card, I used the Wedding Party set from Flourishes. I stamped it in black ink on shimmer card stock, added color with watercolor crayons. I added some Dazzling Diamonds glitter to the body of her dress with my Quickie Glue Pen, then gave her a necklace, and accented her veil and dress with some gems. The sentiment is white embossed. 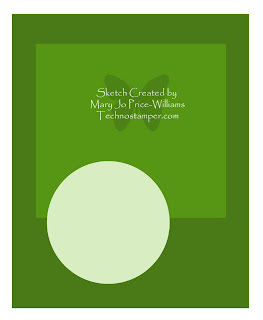 On this last card I rotated the sketch again, and replaced the circle image in MJ's sketch with a butterfly. Great cards Lisa!! I love the way you turned all the sketches. Wow! Look at you, these are all wonderful. I love the colors on the first one, the image on the second one is just so sweet and the butterflies on the third are wonderful! Great job showing how versatile the a layout can be. Thanks for playing. Lisa, your work is gorgeous! I just LOVE, LOVE, LOVE those butterflies! Love all 3 cards. You've made me want to dash off into the stamping/living room and get motivated!! Thanks for the push. 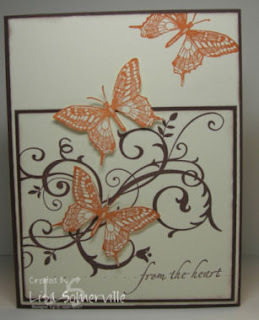 I really like all 3 cards, but LOVE the one with the butterflies!!! Wow Lisa! Those are beautiful!!! That first flower card almost looked like the one I had in mind to do using Heartfelt Thanks but I just couldn't make it work. Great job on all 3 of the cards, they all look so different!